The following U.S. policies are among those which support the development of technologies to reduce odor, greenhouse gas emissions, water pollution and other environmental damages caused by CAFOs. Expansion of these programs and their use in conjunction with new waste management technologies stands to benefit the livestock sector while protecting rural communities. The Energy Policy Act was enacted in 2005 with the objective of increasing the popularity of energy efficient policies in the United States through tax incentives for the public. The Act increased awareness of renewable energy sources, decreased the use of automobiles and motor fuels, and increased overall education on the different types of climate change technology within the production industry. The Energy Policy Act created market incentives for domestic energy production, encouraging renewable energy sources. The policy also incentivized certain types of animal feed, and sought ways to reduce ethanol produced by animal waste. A Renewable Energy Portfolio Standard (RPS), referred to as a Renewable Energy and Energy Efficiency Portfolio Standard (REPS) in North Carolina, is a state-mandated policy that requires electric utility companies to source a certain percentage of the electricity they supply from renewable energy sources. Just over half of U.S. states have a Renewable Energy Portfolio Standard. Because REPS are state-mandated policies, not all states have renewable energy portfolio standards, and these standards can vary from state to state. For each megawatt hour of renewable energy produced by approved Renewable Energy Facilities (REFs), one Renewable Energy Certificate (REC) is created. In order to comply with an applicable REPS target, an electric utility may choose to generate renewable energy by investing in renewable infrastructure, or alternatively, purchase electricity or RECS produced by an REF. RECs may be purchased from qualifying in-state and out-of-state facilities. North Carolina’s Renewable Energy and Energy Efficiency Portfolio Standard (REPS) was established in 2007, under Session Law 2007-397 (Senate Bill 3). Investor-owned utilities, operating within the state, are required to source 12.5% of 2020 retail electricity sales, from qualifying renewable energy sources, by 2021; electric cooperatives and municipal utility companies are required to obtain RECs for 10% of all energy sales. North Carolina's REPS is unique in that it is the only RPS in the United States that mandates technology-specific renewable energy targets from animal waste sources: 0.2% of 2018 retail energy demand from swine waste biogas by 2019, and 900,000 MWh (or equivalent) from poultry waste derived energy by 2014. North Carolina's swine and poultry waste set-asides have spurred investment and development of novel waste management and waste-to-energy technologies for use on North Carolina's swine and poultry CAFOs. While most electric power suppliers are on track to meet the 2016 general REPS requirements, they are not expected to meet the swine or poultry waste set-asides. As a result, the North Carolina Utilities Commission has delayed the implementation of the swine waste set-aside requirements, as it has done every year since 2012. North Carolina's current swine waste set-asides are: 0.07% of retail energy demand for 2017-2018, 0.14% for 2019-2021, and 0.20% for 2022. Carbon offsets refer to the reduction of one unit of carbon dioxide equivalent of greenhouse gases emitted in one place to compensate for emission of that unit in another place. Offsets projects must be real (an actual reduction in emissions relative to the baseline), permanent (not reversible), additional (the reduction would not have been made absent the intervention), verifiable, and enforceable. 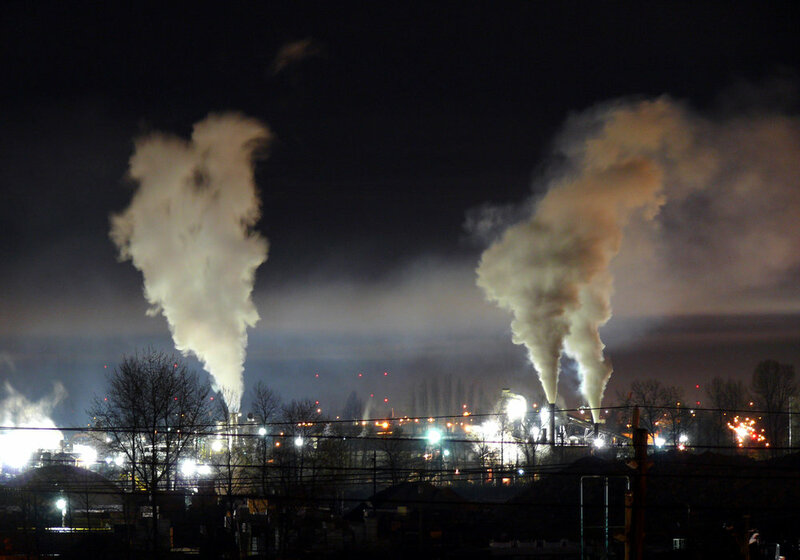 While many people think of a carbon-emitting entity as a factory with smokestacks (pictured at left), more and more companies, institutions, and even individuals are seeking to purchase carbon offsets. Carbon offsets initiatives allow governments and other institutions to achieve greenhouse gas emissions reduction goals and even achieve carbon neutrality. Carbon offsets initiatives can also serve as a funding mechanism for projects like the installation of waste-to-energy technology at livestock operations. In addition to selling RECs to electric utilities subject to RPS requirements, livestock farm operators who install waste-to-energy systems or alternative waste management technologies that capture and eliminate greenhouse gas emissions can subsidize the costs of installation and maintenance by selling the carbon credits generated to high-emitting entities. The Environmental Quality Incentives Program (EQIP) is a program administered by the USDA Natural Resources Conservation Service (NRCS) that provides financial and technical assistance to producers seeking to implement conservation practices on their agricultural land. Financial assistance is provided through cost-sharing or incentive payments. All farmers are considered on a first come, first serve basis, but selections are made based on predetermined priorities and ranked criteria established by local Soil and Water Conservation Districts. These priorities can range from projects that reduce non-point source pollution to habitat conservation. Soil and Water Conservation Districts select priorities based on local issues of concern and in response to initiatives promoted in the Farm Bill. There are existing initiatives that would favor projects that implement animal waste technology, such as a National EQIP Initiative focused on addressing agricultural air quality concerns (including greenhouse gas emissions, air borne particles, and other pollutants). Local District Conservationist discussed conservation with this tobacco farmer in North Carolina. Photo by Bob Nichols, USDA Natural Resources Conservation Service, 2011. The NRCS also provides valuable technical support to farmers through Conservation Practice Standards, with which producers must comply to receive EQIP cost-share funds. Each field office has a technical guide, which provides information tailored to its specific geographic location on a wide array of practices. Many of the Conservation Practice Standards specifically relate to appropriate methods of waste management, such as the right amendments for the treatment of agricultural waste, set up of anaerobic digesters, compost facilities, and more. NRCS can also provide the expertise to help farmers adhere to those standards, as shown in the image on the right. The USDA is charged with organizing the Repowering Assistance Program. This program works to promote renewable energy use by providing funding for biorefineries to install renewable biomass systems for heat and power for their facilities. 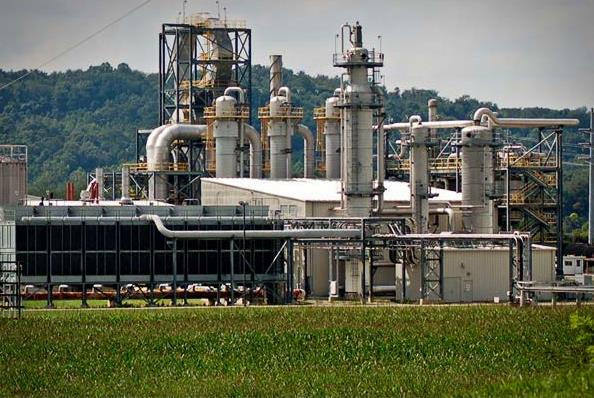 The Three Rivers Energy biorefinery in Coshocton, OH produces corn-based ethanol. Photo courtesy Three Rivers Energy, via Flickr. This work is licensed under a Creative Commons Attribution 4.0 International License. Applications are accepted only from July 25 - October 24 of each year. Funding is limited to 50% of the project costs and there is a maximum award amount updated every year in the annual federal register notice. In 2016, the maximum funding was $500,000. Therefore, in cases where fund seekers need more than 50% funding or if 50% funding is greater than the maximum allowed contribution, this program may not be ideal. USDA’s funding match is limited to the costs of construction and the agency will not fund any type of system maintenance once the system is installed. The Public Utilities Regulatory Policy Act (PURPA) was enacted in 1978 with the intent to incentivize renewable energy development, primarily through Standard Offer Contracts. These are agreements between individual energy producers and larger energy suppliers, such as Duke Energy. The contracts allow for small-scale energy facilities that produce up to 5 MW to sell their energy directly to the grid. Furthermore, in North Carolina renewable energy producers may enter into Power Purchase Agreement (PPA) with Duke Energy to sell the energy they produce, either at a Standard Option price or at a Negotiated PPA. In order to qualify for the Standard Option price, a small-scale energy facility must produce under 5 MW fueled by renewable sources (animal waste is included), and be a qualifying facility. Find more information about qualifying facilities and how to obtain QF status here.